The Benjamin Discovery is a pre-charged pneumatic air rifle available in .22 and .177 calibers. It can shoot at up to 900 feet per second, and it is incredibly reliable. The Discovery is so precise that pellet shots easily pass through the holes of pellets that were shot before them. This indicates an extreme maintenance of target placement and accuracy. The Benjamin Discovery only requires 2,000 psi of air to operate effectively, meaning the user will do less pumping compared to many other models. The model is not affected by outdoor temperature, and it comes with a walnut stock. It also features fiber optic front and rear sights. From the moment the box is opened, the Discovery is bound to be the easiest PCP rifle a typical shooter has come across. Those looking to purchase a high-quality air rifle at an affordable price should consider the information in this Benjamin Discovery review before making a final decision. Recoil: The Discovery is a very powerful rifle, and it is also very loud. Despite these characteristics there is no recoil effect. Weight: In addition to being one of the easiest PCP rifles anyone has ever used it is also likely to be one of the lightest. The gun alone comes in at just over 5 pounds and with the scope attached it makes it to almost 6 pounds. Easy: The Discovery is known for being easy to set up and use, and an easy rifle is lots of fun to shoot. Trigger: The trigger can be a bit “clicky.” While hard to maneuver, the rifle is so powerful that an “easy” trigger might be too much of a hazard. Loudness: The sound of the Benjamin Discovery is extremely loud. This prevents it from being used in residential areas. The sound has been described as “sharp,” “crackling” and “similar to a wild fire.” This problem can be overcome with certain modifications, but such changes would significantly add to the price. Single Load: The rifle does not feature a rotary clip, so loading it may be a bit cumbersome for some users. Get The Benjamin Discovery With a Stealing Price Now! The Benjamin Discovery is one of the most complete PCP rifles available. It is incredibly accurate, powerful and consistent. It is extremely easy to use and master, and it serves as a more practical alternative to the Benjamin Marauder. The smaller pressure requirement results in less time pumping. All-in-all the Discovery is a very impressive rifle that satisfies nearly everyone that uses it. An exquisite machine deserves the same acknowledgment in its look. The elaborate design of the Benjamin Discovery features a walnut stock made just for this model. This look offers a more authentic rifle appeal than other rifles. The barrel is smooth and black, as is the trigger. The Discovery is recognized as an incredibly powerful rifle that can accomplish nearly any task from shooting targets to hunting game. The accuracy of this rifle is already impressive. Shots can be made superbly at longer distances without deviating from the pattern. With the included sights the accuracy is enhanced even more. Repeated shots can place pellets in the same holes. The accuracy is one of the defining traits of this air rifle, and it never fails to deliver. This model is made to be durable and tough. It lasts for years even after the wear placed upon it by its forceful nature. The Discovery is as reliable as it is accurate. Repeated shots pass the same pellets holes whether shooting 20, 40 or even 70 shots. Grouping are extremely close, but pellets will usually pass through completely. The Discovery is similar to the Marauder in that it can perform and meet the same needs of shooters considering that rifle. The advantage to the Discovery is its weight. The lighter Discovery is better suited to carrying around on hunting trips for hours on end. This model is much easier to pump for those without as much physical strength. It only requires 2,000 psi of air. This smaller requirement results in less pumping. Less pumping means more time to enjoy the rifle without worrying about powering up the shots. The Benjamin Discovery is so simple to use it can be figured out right out of the box. After a few minutes the rifle can be in full working order ready to hunt or use for target practice. Once pumped, users can expect at least 25 shots before power is compromised. This rifle is available in two models depending on users needs or expectations. The .177 caliber and the .22 caliber models are available. Both can be found for the same price, but the .22 caliber is often much more expensive. The Benjamin Discovery may range in price from $250 to $400. It should be considered that the rifle is available in both .22 and .177 caliber varieties. No matter its price, the features it has to offer make it an affordable rifle for its class. It is still a suitable choice for beginners as well. 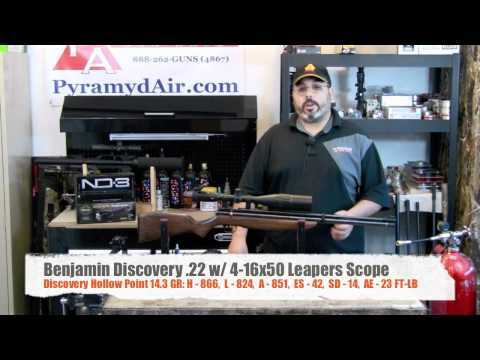 The Benjamin Discovery is a lightweight gun with lots of power. For its capabilities it can be considered as affordable. The powerful rifle is consistent with each shot, and it is made well enough to offer the same consistency throughout its use. It can operate on just 2,000 psi to work properly. It is so accurate shots reach the exact target time and time again. The accuracy prevents the shot from deviating from its pattern and allows it to easily reach the target with each trial. The only downfall to its power is the incredibly loud volume. It is best suited for areas where the shooter is away from homes and neighbors. Even still, the gun is one that friends and family will love to use when the time is right. Another benefit to the Benjamin Discovery is its longevity. It can last for years when treated with the proper care and concern. It is much easier to transport than the Benjamin Marauder, so it is much better when considering long hunting trips. The Discovery is also great for hunting small game as long as its away from yards and streets. Many users claim that once they experience the Benjamin Discovery they have no desire to shoot with another air rifle again.